In this new report titled “IV Tubing Sets and Accessories Market: Global Industry Analysis 2012–2016 and Forecast 2017 – 2025,” the analysts working in the healthcare domain have considered weighted average pricing for different IV tubing sets and accessories used in infusion therapy. This has been done based on information gathered from reliable secondary sources validated through marketplace discussions and private company databases. According to this report that has recently been published by Persistence Market Research, pricing values of IV tubing sets and accessories have been counter validated with market experts through primary research along with regional variations in price levels. This pricing analysis includes product margins from the manufacturers supplying their products through distribution channels. While examining the global IV tubing sets and accessories market in detail, we haven’t taken currency fluctuations into account and pricing analysis is static in nature. Weighted averaging of high-end and low-end pricing has been done to rule out the effect of extreme values and brand weightages. A demand-supply gap analysis has been performed involving both marketplace discussions and desk research to determine pricing premiums. The report starts with a market overview and provides market definition and synopsis. The section that follows presents the market dynamics, which includes market drivers, restraints, opportunities and challenges in the market. The macro-economic factors that influence the global IV tubing sets and accessories market are also discussed in this section. The next section of the report provides detailed market share analysis, Y-o-Y growth and market attractiveness analysis on the basis of segments such product type, end use, application, age and region. The report provides a market outlook for 2017–2025 and sets the forecast within the context of the global IV tubing sets and accessories market. The section represents the market on the basis of product type and end use applications along with the shares from major countries in the respective regions. The section also represents the opportunities in the respective regions. In the last section of the report, a competitive landscape has been included to offer report audiences with a dashboard view. Detailed profiles of manufacturers are also encompassed within the scope of the report to evaluate their key offerings, long and short-term strategies and recent progress in the global IV tubing sets and accessories market. Market volume is inferred through in-depth secondary research and validated from industry experts through primary interviews. Each interview is thoroughly analyzed and average market volume is deduced and reconfirmed prior to incorporating in the report. The price of IV tubing sets and accessories is deduced on the basis of average spending for the manufacturing of the particular type of system and its product with the average length of systems. For forecasting the global IV tubing sets and accessories market, various macroeconomic factors and changing trends have been observed, giving an idea about the future of the market. In the compilation of the report, the forecasts are conducted in terms of CAGR, while other important criteria such as year-on-year growth and incremental dollar opportunity have also been incorporated presenting the client with crystal clear insights and future opportunities as far as the global IV tubing sets and accessories market is concerned. The global IV tubing sets and accessories market is expected to witness robust growth during the forecast period. This growth is expected to be primarily driven by increasing acceptance of new technology such as filtered IV tubes and IV tubing sets with flow regulators owing to several benefits such as improved medication, precise and accurate drug delivery and faster results. Further, products from various companies are in the pipeline for approval, which is anticipated to fuel market revenue growth in the coming years. Key marketing strategies adopted by the top market companies is also expected to boost the growth of the global IV tubing sets and accessories market. IV tubing sets are intended to deliver fluids including nutrients and medications into a patient’s body in controlled amounts. The increased patient base in different regions comprising patients affected with diabetes and chronic pain is anticipated to drive the growth of the global IV tubing sets and accessories market. The APAC region offers strong growth potential for IV tubing sets and accessories on account of the increasing manufacturing base for infusion sets by the leading market players. For instance in 2015, Medtronic became the market leader for smart infusion pumps and consumables (IV tubing sets) in APAC comprising two-third share in the global market. Increasing prevalence of chronic disease cases such as cancer have resulted in the development and introduction of advanced IV tubing sets to be used in infusion therapy for efficient treatment methods. This can be attributed to better healthcare and greater awareness regarding cost-effective therapies involving high consumption of IV tubing sets. Highly populated countries have a high incidence and prevalence of chronic diseases such as stroke, which in turn, is increasing the demand for infusion therapy and thereby driving the production of IV tubing sets. The Middle East and Africa IV tubing sets and accessories market is also expected to witness substantial growth over the forecast period. Over the last few years, an increase in the demand for branded and patented smart IV infusion pump systems and associated IV tubing sets has been registered from end users such as hospitals, ambulatory surgical centers, homecare settings and long term care centers in Europe as compared to Asia Pacific. Besides, growing import and export of infusion pumps, consumables and supplies in countries such as France, Netherlands, United Kingdom, Poland and Russia is anticipated to boost the growth of the global IV tubing sets and accessories market. The steady rise in the demand for primary IV infusion sets with add-on accessories such as filters, IV flow regulators, vented sets and more from various end users mainly hospitals, long-term care centers, specialty clinics, ambulatory surgical centers and skilled nursing facilities to direct the drug fluids through intravenous (IV) route of administration using advanced IV tubing sets is expected to spur revenue generation in the IV tubing sets and accessories market across the globe. 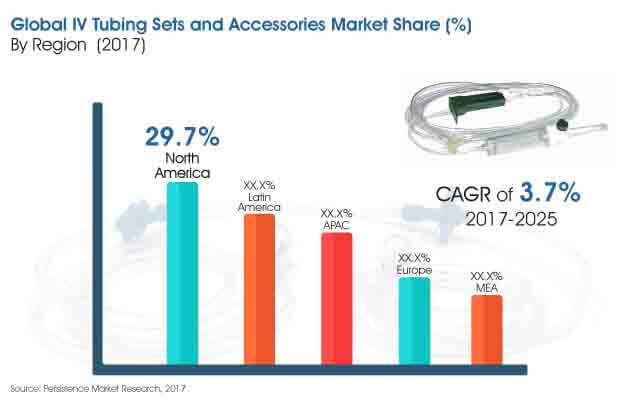 North America dominated the global IV tubing sets and accessories market in revenue terms in 2016 and is projected to hold a market share of 28.9% by 2025. North America is anticipated to be an attractive market for IV tubing sets and accessories, with a market attractiveness index of 1.3 during the forecast period. The North America IV tubing sets and accessories market is expected to grow from more than US$ 270 Mn in 2017 to slightly over US$ 360 Mn by 2025 end. This represents a CAGR of 3.3% over the forecast period.